For other uses of "ICD", see ICD (disambiguation). Isobaric counterdiffusion was first described by Graves, Idicula, Lambertsen, and Quinn in 1973 in subjects who breathed one inert gas mixture (nitrogen or neon) while being surrounded by another (helium). In medicine, ICD is the diffusion of gases in different directions that can increase the pressure inside open air spaces of the body and surrounding equipment. An example of this would be a patient breathing nitrous oxide in an operating room (surrounded by air). Cuffs on the endotracheal tubes must be monitored as nitrous oxide will diffuse into the air filled space causing the volume to increase. In laparoscopic surgery, nitrous oxide is avoided since the gas will diffuse into the abdominal or pelvic cavities causing an increase in internal pressure. In the case of a tympanoplasty, the skin flap will not lay down as the nitrous oxide will be diffusing into the middle ear. An example of this would be breathing air in an heliox environment. The helium in the heliox diffuses into the skin quickly, while the nitrogen diffuses more slowly from the capillaries to the skin and out of the body. The resulting effect generates supersaturation in certain sites of the superficial tissues and the formation of inert gas bubbles. These isobaric skin lesions (urticaria) do not occur when the ambient gas is nitrogen and the breathing gas is helium. An example of this was shown in the literature by Harvey in 1977 as divers switched from a nitrogen mixture to a helium mixture (diffusivity of helium is 2.65 times faster than nitrogen), they quickly developed itching followed by joint pain. Saturation divers breathing hydreliox switched to a heliox mixture and developed symptoms of decompression sickness during Hydra V. More recently, Doolette and Mitchell have described ICD as the basis for inner ear decompression sickness and suggest "breathing-gas switches should be scheduled deep or shallow to avoid the period of maximum supersaturation resulting from decompression". It can also happen when saturation divers breathing hydreliox switch to a heliox mixture. Lambertsen made suggestions to help avoid ICD while diving. 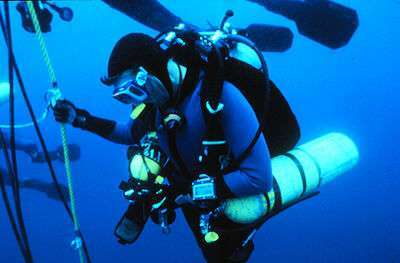 If the diver is surrounded by or saturated with nitrogen, they should not breathe helium rich gases. Lambertson also proposed that gas switches that involve going from helium rich mixtures to nitrogen rich mixtures would be acceptable, but changes from nitrogen to helium should include recompression. However Doolette and Mitchell's more recent study of Inner Ear Decompression Sickness (IEDCS) now shows that the inner ear may not be well-modelled by common (e.g. Bühlmann) algorithms. Doolette and Mitchell propose that a switch from a helium-rich mix to a nitrogen-rich mix, as is common in technical diving when switching from trimix to nitrox on ascent, may cause a transient supersaturation of inert gas within the inner ear and result in IEDCS. A similar hypothesis to explain the incidence of IEDCS when switching from trimix to nitrox was proposed by Steve Burton, who considered the effect of the much greater solubility of nitrogen than helium in producing transient increases in total inert gas pressure, which could lead to DCS under isobaric conditions. Recompression with oxygen is effective for relief of symptoms resulting from ICD. However, Burton's model for IEDCS does not agree with Doolette and Mitchell's model of the inner ear. Doolette and Mitchell model the inner ear using solubility coefficients close to that of water. They suggest that breathing-gas switches from helium-rich to nitrogen-rich mixtures should be carefully scheduled either deep (with due consideration to nitrogen narcosis) or shallow to avoid the period of maximum supersaturation resulting from the decompression. Switches should also be made during breathing of the largest inspired oxygen partial pressure that can be safely tolerated with due consideration to oxygen toxicity. A decompression planning software tool called Ultimate Planner attempts to predict ICD through modeling the inner ear as either aqueous (Mitchell and Doolette's approach) or lipid tissue (Burton's approach). 1 2 3 4 5 Hamilton, Robert W; Thalmann, Edward D (2003). "Decompression Practice". In Brubakk, Alf O; Neuman, Tom S. Bennett and Elliott's physiology and medicine of diving (5th ed.). United States: Saunders. pp. 477–8. ISBN 0-7020-2571-2. OCLC 51607923. ↑ Lambertson, Christian J; Bornmann, Robert C; Kent, MB, eds. (1979). Isobaric Inert Gas Counterdiffusion. 22nd Undersea and Hyperbaric Medical Society Workshop. UHMS Publication Number 54WS(IC)1-11-82. Retrieved 10 January 2010. ↑ Graves, DJ; Idicula, J; Lambertsen, Christian J; Quinn, JA (February 1973). "Bubble formation in physical and biological systems: a manifestation of counterdiffusion in composite media". Science. 179 (4073): 582–584. Bibcode:1973Sci...179..582G. doi:10.1126/science.179.4073.582. PMID 4686464. Retrieved 10 January 2010. ↑ Graves, DJ; Idicula, J; Lambertsen, Christian J; Quinn, JA (March 1973). "Bubble formation resulting from counterdiffusion supersaturation: a possible explanation for isobaric inert gas 'urticaria' and vertigo". Physics in medicine and biology. 18 (2): 256–264. Bibcode:1973PMB....18..256G. doi:10.1088/0031-9155/18/2/009. PMID 4805115. Retrieved 10 January 2010. ↑ Barash, PG; Cullen, BF; Stoelting, RK (2005). Clinical Anesthesia (5th Rev ed.). United States: Lippincott Williams & Wilkins. ISBN 0-7817-5745-2. ↑ Hamilton & Thalmann 2003, pp. 477–478. 1 2 3 Lambertson, Christian J (1989). Relations of isobaric gas counterdiffusion and decompression gas lesion diseases. In Vann, RD. "The Physiological Basis of Decompression". 38th Undersea and Hyperbaric Medical Society Workshop UHMS Publication Number 75(Phys)6-1-89. http://archive.rubicon-foundation.org/6853. Retrieved 10 January 2010. 1 2 3 4 Lambertson, Christian J (1989). "Relations of isobaric gas counterdiffusion and decompression gas lesion diseases". In Vann, RD. The Physiological Basis of Decompression. 38th Undersea and Hyperbaric Medical Society Workshop. UHMS Publication Number 75(Phys)6-1-89. Retrieved 10 January 2010. 1 2 D'Aoust, BG; White, R; Swanson, H; Dunford, RG; Mahoney, J (1982). "Differences in Transient and Steady State Isobaric Counterdiffusion". Report to the Office of Naval Research. Retrieved 10 January 2010. ↑ Hills, Brian A. (1979). Kent, MB, ed. "Counter transport of inert gases: Effects of steady state and transient gradients.". Isobaric Inert Gas Counterdiffusion. 22nd workshop, Chairs: Lambertsen, CJ; Bornmann, RC. Philadelphia, Pennsylvania. : Undersea Medical Society. p. 151. Retrieved 18 March 2016. ↑ Harvey, CA (1977). "Shallow saturation hyperbaric exposures to nitrogen-oxygen environments and isobaric switches to helium oxygen". Undersea Biomedical Research, Annual Meeting Abstract. Retrieved 10 January 2010. ↑ Rostain, JC; Lemaire, C; Gardette-Chauffour, MC; Naquet, R (1987). Bove; Bachrach; Greenbaum, eds. "Effect of the shift from hydrogen-helium-oxygen mixture to helium oxygen mixture during a 450 msw dive". Underwater and hyperbaric physiology IX. Bethesda, MD, USA: Undersea and Hyperbaric Medical Society. 1 2 3 4 5 Doolette, David J; Mitchell, Simon J (June 2003). "Biophysical basis for inner ear decompression sickness". Journal of Applied Physiology. 94 (6): 2145–50. doi:10.1152/japplphysiol.01090.2002 (inactive 2015-01-09). PMID 12562679. Retrieved 10 January 2010. ↑ Partridge, Matthew. "Isobaric Inert Gas Counter diffusion" (PDF). Retrieved 14 March 2016. ↑ Burton, Steve (2011). "Isobaric Counter Diffusion How to avoid a Isobaric Counter Diffusion hit". ScubaEngineer.com. Retrieved 14 March 2016. ↑ Burton, Steve (December 2004). "Isobaric Counter Diffusion". ScubaEngineer. Retrieved 10 January 2010. 1 2 3 4 Burton, Steve (December 2004). "Isobaric Counter Diffusion". ScubaEngineer. http://www.scubaengineer.com/isobaric_counter_diffusion.htm. Retrieved 10 January 2010. ↑ Salama, Asser (2014). "Ultimate planner (deco software)". Tech Diving Mag. Asser Salama. Retrieved 17 March 2016.